Each year, the average American household spends nearly three months' pay on transportation. Center for Neighborhood Technology, 2009 in AZ Central.com, 2009, "Average cost of transport consumes 3 months' pay"
Century Cycles owner Scott Cowan was just in Seattle to see the 2010 Raleigh and Diamondback line-up (which is obviously so hot it caused a record heat wave) and he heard an inspirational presentation from Tim Blumenthal, the executive director of Bikes Belong. Big takeaway? There is more money coming toward bike lanes and bike infrastructure times 100 than we've seen in the past 20 years. Bipartisan support for bicycling is strong and things are moving forward in a positive way thanks to the initiatives of Bikes Belong. Also inspiring? Bikes Belong new slogans: "Get more people on bicycles more often." 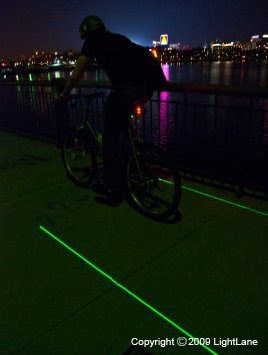 and "When people ride bikes, good things happen." Amen! 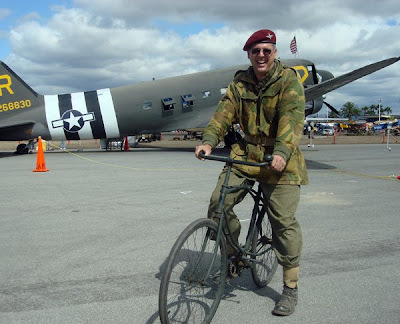 David Towne, a pilot for Continental Airlines, a member of the Medina County Bicycle Club, and a regular customer in our Medina store, took a trip to France to watch the Tour de France and ride some of the race routes. 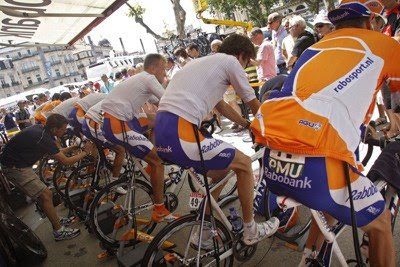 He sent us these pictures from the Alpe d'Huez, the most infamous mountain climb in the race's history. Thanks, Dave! Isn't that a certain well-known American bike racer shown on that sign...? If you've got the itch to race this weekend, head to Akron for the Rubber City Meltdown, a criterium race on a 1-mile per lap track. 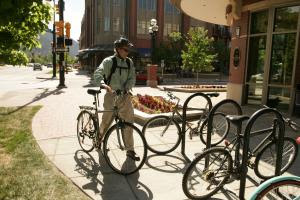 It's all part of the Akron Cycling Festival, and also includes a "Blue Line Tour" (a non-competitive ride on parts of the Akron Marathon course and the Towpath Trail), and Bike the Trail - Ride the Rail. Q: What's the trick to riding your bicycling upside down? A: Lots of centrifugal force along a loop-the-loop track, as performed by Allo "Dare Devil" Diavolo in a 1901 circus stunt, say David Halliday and others in"Fundamentals of Physics." Diavolo coasted down a long runway, building up speed until he hit the approximately 8.8-foot-radius loop, then up and over he went. Based on elementary physics, this figures to a minimum necessary speed for Diavolo of 16.8 feet per second, or about 11.4 mph, to prevent his losing contact with the upper loop and falling. 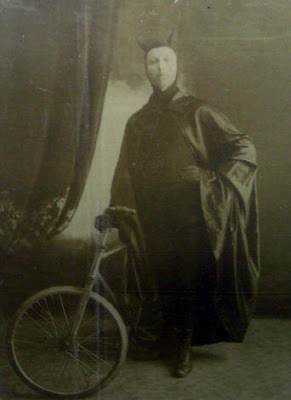 This speed requirement was independent of the weight of Diavolo and the bicycle. "Had he feasted on, say, pierogies before his performance, he still would have had to exceed only 11.4 mph," the authors say. Devil horn costumes obviously don't factor in, then -- or DO they...??? Late Friday afternoon, the Peninsula crew had the opportunity to help out two very adventurous cyclists, Morrigan and Allan. 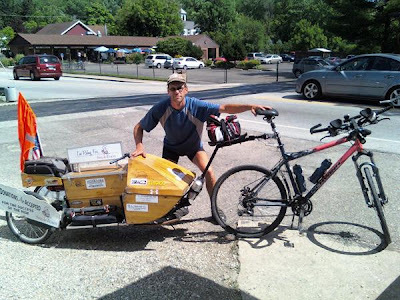 The two were within 200 miles of completing a 10,000+ mile plus ride around the US. Allan had been having some issues with an out of true wheel and they had considered just pressing on, but fate stepped in while I was outside the shop and shouted "Hi" to them. They figured they were here, and would have both bikes looked at to make sure the last push was issue-free. Allan's bike just needed some minor tweaks, a new rear tire, and some new brake pads. Morrigan's bike needed a little more; the cassette body on the rear wheel was about to come completely off. Something missed by other shops, a shameless plug for us! The delay was gonna make it too late in the day for them to make the next campground, so I offered my floor to them, and they quickly accepted. I think the idea of a shower and AC helped. Dinner at the Winking Lizard is where I found out more about their trip. To sum up, I consider myself privileged to have been able to help them out; it didn't hurt that they loved some of my photos. Allan my even used one of them for a separate project. 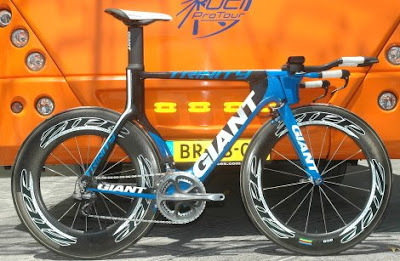 I should also mention that they are riding Giant FCR 3's. 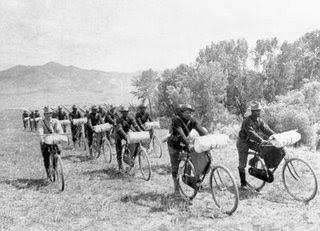 While these are not bikes specifically built for very long distance tours, they had held up and worked fine. The term "bike salmon" and the artwork above are from Bike Snob NYC -- part of his campaign against the "directionally challenged irritants" who are "a menace to us all." 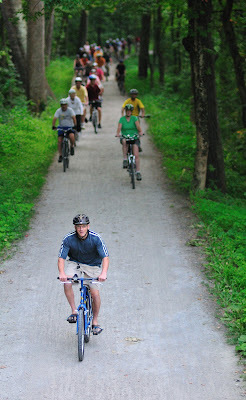 Our next Night Ride on the Towpath Trail is this Saturday, July 25, 2009. The ride starts at 8pm from our Peninsula store. As always, go to www.centurycycles.com/for/nightrides for full details! This is my son's 9th summer. This is his first summer riding a bike, thanks to our discovery of this video on this website about two weeks ago. Dan Polito builds bicycle frames by hand out of steel, right here in Cleveland, Ohio. Who knew? Well, you did, if you've been following this blog and our coverage of the North American Handmade Bicycle Show. Many more people around the world know it as well, after Dan won the Best of Show Award. Now the readers of Cleveland Scene magazine know it. 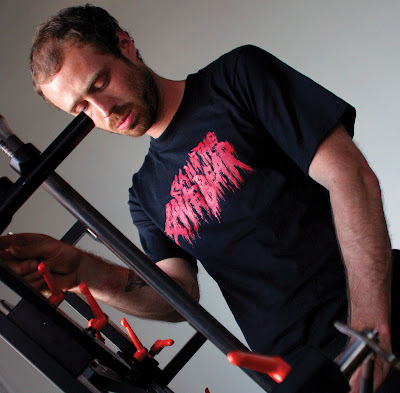 You can read the profile of Dan and the growth of his local business Cicli Polito here. My favorite part of the article is Dan's way of comparing the different bike frame materials: "An aluminum bike is like riding a two-by-four. Riding a carbon fiber bike feels like paddling a kayak in the water. A steel bike feels like the road." 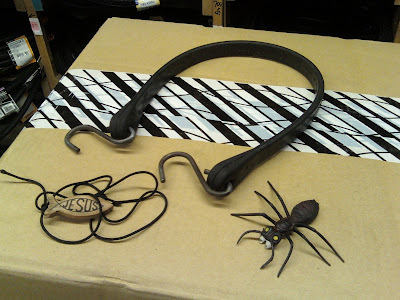 A relatively new bike accessory company called Lezyne has been in business for just a couple of years now. 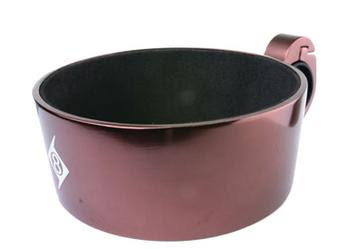 Their products are well-thought-out and designed to be practical and useful. Probably their biggest hit has been their line of mini-pumps. We've been stocking the Pressure Drive Small model, and it's proven to be a popular item. What distinguishes their mini-pumps is a detachable air hose that stows inside the pump barrel when not in use. The hose is reversible to work on either Presta or Schrader valves, without the need to disassemble the pump head to switch modes. 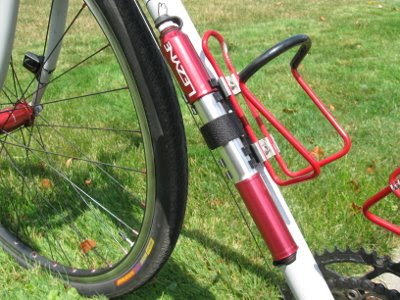 Having the flexible hose means that there's less of a chance that you'll rip out the valve from your tube as you're pumping up a flat tire on the side of the road. There is an optional hose available that also has a built-in air gauge. I found out, though, that the gauge hose only fits inside the Medium or larger models of mini-pumps, not the Small models. The Lezyne mini-pumps have so far only been available in Black. They've also made some available is Silver, only as an included accessory on select bicycle models, such as the '09 Raleigh Clubman. Now, for those of us who like to match our accessories to all of the fancy-colored components on our bikes, you can get the Lezyne pumps in Red, Blue, or Gold. By special-order; please call us to check availability. Check out the Red one here on my Surly Cross-Check! Remember this little comics gem from Stephan Pastis in "Pearls Before Swine?" 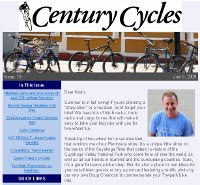 Our latest e-mail newsletter was sent out this past Thursday evening. If you didn't receive it, you can read it online here. If you'd like to sign up to receive it in your Inbox in the future (and catch up on archived past issues), you can do so here. 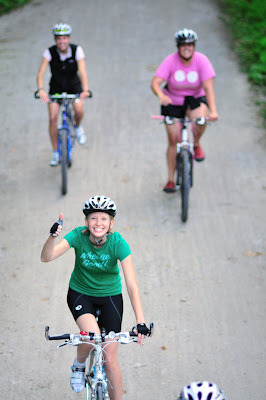 Pictures and wrap-up of our last Night Ride on the Towpath Trail. 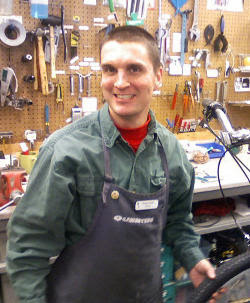 The Medina store’s Tom Wiseman has a 12-year history with Century Cycles, yet has only four years’ tenure as an employee. 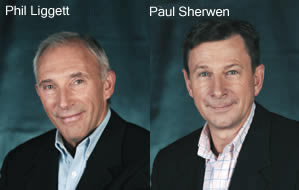 He was on staff from 1997 to 1999, then came back into the Century Cycles fold in 2007. Tom has a strong background in mountain bike racing, but he is no slouch when it comes to road racing, either. He recently came in second in the 35-39 age group in the Twin Sizzler, a 27-mile bike race that’s an annual July 4th tradition in Medina. Q: Congratulations on coming in second in your age group! How did the race go? 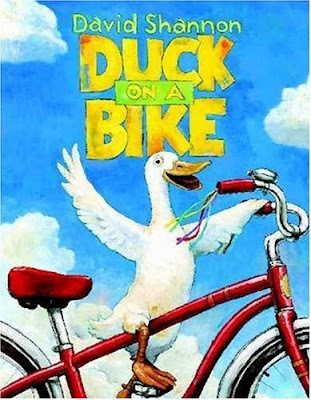 Q: What is your biggest accomplishment on a bicycle? A: Any ride that I don’t crash or break my bike. A: The Fireweed 400 is probably my most memorable race, but it’s not my biggest accomplishment on a bike. I was in Alaska to support the team as a mechanic, but instead of wrenching I ended up riding. It certainly was the best five-day trip I’ve ever had, but I’ve had more exciting races and wins closer to home. I’m much more proud of my mountain bike racing. Q: What’s your biggest accomplishment in mountain bike racing? A: I competed in the Ohio Mountain Bike Racing Series from 1996 until 2006, and I spent four of those years ranked in the top 10. It was a much bigger field of competitors and there was much more adversity to overcome to be successful. Those races are what are really at the top of my accomplishments. But it’s not about racing. 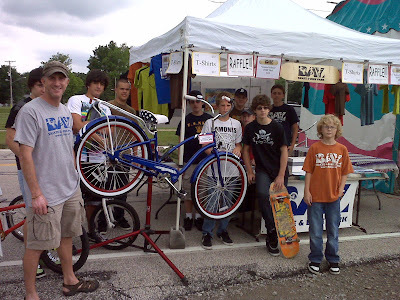 Q: What bike did you ride in the Twin Sizzler and how many bikes do you own? A: I rode a Raleigh Prestige road bike in the Twin Sizzler. I’m down to four bikes now. I had 12, but I had to put my wife through nursing school. A: No. I go through them pretty quickly, getting a new bike every 18 months or so. I’ve owned every manufacturer. Probably the bike I most fondly remember is a Schwinn Homegrown from the mid-1990s. A: My first “real” bike was a Diamondback Apex, which I got as a freshman in college at Kent State. Q: What’s the best mountain bike on the floor at Century Cycles right now? A: I really like the Giant Anthem. I’ve been on it for two years and am not planning to replace it, which is unusual for me. Its durability and ride quality are good. 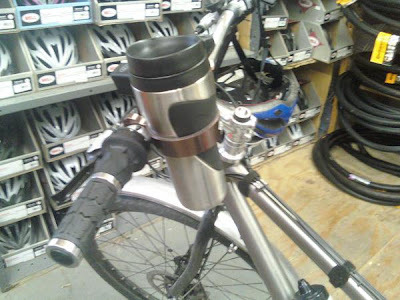 It’s a well-engineered bike. The whole package. A: Vulture’s Knob. I was part of the group that helped Mark Condry build a large percentage of it. He and I are good friends. 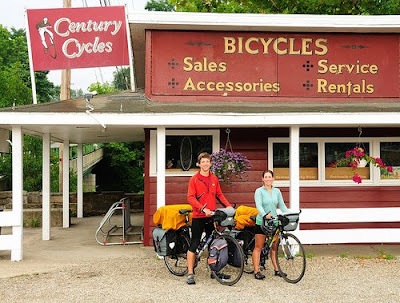 Q: When you’re not riding a bike or working at Century Cycles, what do you like to do? A: I like to spend time with my wife and family. Just relax. Read. I’m a history buff. Anything that helps me get my mind off the everyday stuff. Q: What’s your favorite beer? A: A beer brewed by a guy I grew up with – Hoppin’ Frog Brewery’s Black & Tan. I also really like Hoppin’ Frog Brewery Boris the Crusher, a dark stout. I remember when he used to brew beer in his basement and now he has a brewery near the Goodyear blimp hangar in Akron. A: I was in a race a long time ago and a guy passed me like I was standing still. I asked him, “when do you rest?” He said, “I rest at home.” I do the same thing now – give it everything I’ve got and no rest until I get home. Q: What piece of advice do you try to share with customers? A: Spend the extra now and you’ll thank yourself later. If you think you want it, you do. 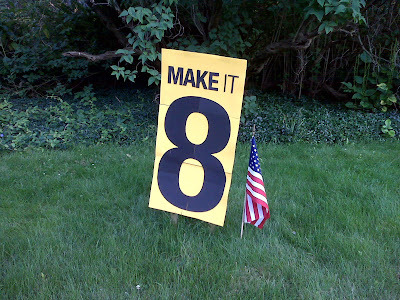 The only thing worse than buyer’s remorse is losing in a sprint. 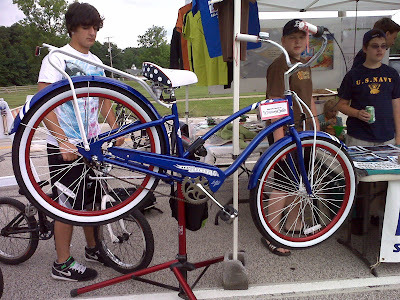 Besides Tom Wiseman, other Century Cycles employees who competed in the Twin Sizzler on July 4th and deserve hearty congratulations include Adam Rady, 1st place in the 20-24 age group; Andrew Copenhavel, 4th place in the 15-19 age group; Drew Rady, 4th place in the 30-34 age group; and Kevin Madzia, 15th place in the 40-44 age group. Way to go!! Most people like to take a break from pedaling once in a while during their bike ride and just coast along, either to cruise down a hill or catch their breath for a few moments on a smooth, flat stretch of road. Many people don't understand the inner workings of the mechanism that allows you to coast. What keeps your feet from having to keep moving with the wheels? The answer is either a freewheel or a freehub. All modern multi-speed bikes use either a freewheel or a freehub system on the rear wheel, unless they are using an internally geared rear hub. Most bikes with 7 gears or less on the rear wheel use a freewheel; most bike with 8 gears or more on the rear wheel use a freehub, although there are some 7-speed freehub systems in use. The outward appearance of a freewheel and a freehub is not noticeably different to the average bicycle owner. In both cases, inside the freewheel or freehub is a set of bearings that are separate from the bearings inside the wheel's main axle. Working in conjunction with these bearings is a set of spring-loaded pawls. When you pedal forward, the pawls lock into position to turn the wheel forward. When you stop pedaling, the pawls release, causing the clicking sound that you usually hear when coasting. The difference between a freewheel system and a freehub system is in the location of the coasting mechanism. On a freewheel system, the coasting mechanism is built into the gear cluster. The term "freewheel" refers to the whole gear cluster with the coasting mechanism inside. The freewheel is screwed onto a set of threads on the right-hand side of the wheel's hub. On a freehub system, the coasting mechanism is a sub-assembly of the wheel's hub. The gear cluster is a unit with non-moving parts, and is referred to as a cassette. The cassette slides into place onto the freehub body and is held in position by a series of ridges, or splines, and locked in place using a cassette lockring. The diagram below highlights the differences between freehub system (top) and a freewheel system (bottom). The red dots indicate the position of the main hub's axle bearings. Notice how they are more widely spaced on the freehub axle compared to the freewheel axle. The freewheel bearing placement worked great for decades and was durable enough for most applications. However, when mountain biking exploded in the 1980's, riders experienced frequent problems with their axles snapping in half. This led to the development of the more durable freehub system, and it's used on most better bikes (road as well as mountain) priced over $400. You are still likely to find the less-expensive freewheel system on bikes under $400. When the mechanism wears out in a freewheel, you just replace the entire freewheel (with gear cluster). When the freehub mechanism wears out, you can remove the cassette, replace the freehub, then re-install the cassette. These days, since freewheels are mostly used on kid's bikes and less-expensive adult bikes, the quality level of most replacement freewheels available are pretty much equivalent. However, there are a wide range of freehubs available from a variety of manufacturers today. One of the things that makes one freehub better than another is the number of pawls in the freehub mechanism, and the number of engagement points for the pawls. Increasing the number of pawls and/or engagement points makes the freehub engage faster when you start pedaling, with less free "spinning" before the force of your legs gets put to use. For single-speed drive trains, both the freewheel and and freehub mechanisms are in common use. The working principle for both is the same as their multi-speed brethren. 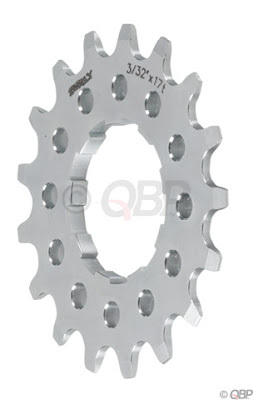 A single-speed freewheel has the coasting mechanism built inside a single cog that is bolted onto the wheel's main hub. These are common on BMX bikes, most single-speed kid's bikes, and many single-speed mountain bikes (both high- and low-end). 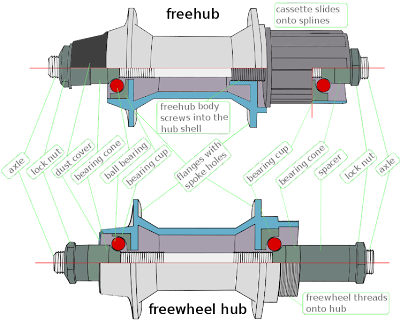 A single-speed freehub has the same type of splines as a multi-speed freehub; the freehub body is just shorter to accomodate a single cassette cog. The are common on many single-speed mountain bikes (both high- and low-end).